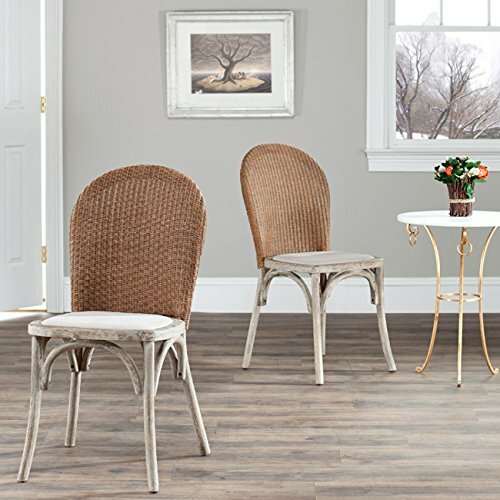 The safavieh mercer collection sharon antique oak finish taupe side chairs is a wonderfully chic piece that is sure to impress your family and friends. it is crafted from solid oak wood that is finished in a pickled oak. the seat is upholstered in a smooth beige linen. the piste de resistance of the sharon side chair is its masterfully woven back. this is a must have piece for anyone with an elegant taste. no assembly required, these chairs measure 21.3-inch wide by 17.7-inch deep by 36.2-inch tall. No assembly required, these chairs measure 21.3 inches wide by 17.7 inches deep by 36.2 inches tall.